7nm test-chip is taped out by semiconductor research alliance headed by IBM. Si Ge (Silicon Germanium) semiconductor material is used as FET channel-material and EUV lithography semiconductor equipment is employed to print 7nm width patterns in this test chip. Self assembly is also anticipated to have been used at this node. 7nm is like packing your ARM Cortex M processor on the tip of a blunt needle. A 7nm chip can pack 20 billion transistors on a fingernail. 7nm really has the punch to disrupt the present computer market in creating a more human like interfaced computers. Its like super computer on a chip. With this type of chip in your smart phone you don't need to connect to cloud for many complex computations. 7nm makes wearble devices 8x or even more powerful than today's most advanced smart phones. 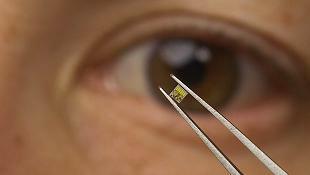 Server on a chip to become common. A chip on your contact-lens will help you to watch video without wearing bulky eye-wear. FPGA made out of 7nm can make your electronics device extremely flexible. Now the industry is already making 16nm and 14-nm chip in production volumes. 10-nm tape-outs have already started. But the 7nm was facing hurdles. EUV and use of Germanium has helped IBM in 7nm test-chip tape-out. IBM said 7nm gets you 50% in the area scaling compared 10nm. The power consumption improvement is also around 50%. This achievement follows long delivery semiconductor research successes by IBM. The chain includes Single Cell DRAM, chemically amplified photoresists, Copper Interconnect Wiring, silicon on insulator, the Strained engineering, multicore microprocessors, immersion lithography, high speed SiGe, High-k Metal Gate , embedded DRAM, 3D chip stacks and Airgap insulators. To achieve 7nm chip-production and more, IBM invested US $3 billion which also involves developing alternative technologies using different approaches by using non-silicon semiconductor material such as III-V. The alliance partners involved in this development are Globalfoundries, Samsung and the College of Nanoscale Science and Engineering of the State University of New York Polytechnic Institute (SUNY). 7nm is still not small-enough to develop human brain like neurosynaptic system. Gordon Moore will be happy to know his famous Moore's law is still working.